I have been planning post about our Christmas decorations. I keep meaning to take pics and get it together but it’s not happening. It is especially not happening today as I have a monumental headache, which began last night. It is not responding to the pathetic drugs I am able to take whilst breastfeeding and I am feeling very sorry for myself. I am unable to wield a camera myself and so the lovely Beefcake has kindly taken some photos of what was to be the highlight of my Christmas decorations post. In parts of Spain, the following jolly gentleman is a traditional element in the nativity scene. When our Spanish friends first told us about him, we didn’t believe them. 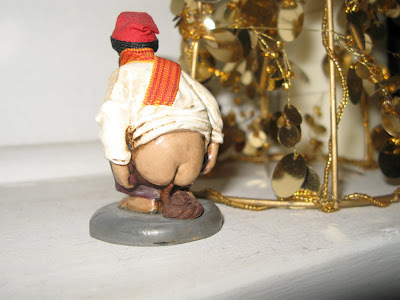 Once we realised how fabulously real El Caganer is, we of course had to purchase one for ourselves. I’m not really sure why a man taking a dump is considered an essential part of the scene surrounding the birth of Jesus. The little statues you can buy do vary in how *ahem* graphic they are in their depiction of the pooping. Ours leans more towards the graphic end of the spectrum. We love him so much that when it is not Christmas he resides on our bedroom mantle piece. So here he is, our most well-loved Christmas ornament, our “pooping man”. Now if that doesn’t get you in the mood for Christmas then nothing will. Posted in Uncategorized and tagged Christmas, Poo. Bookmark the permalink. I have to admit that I hide him behind a candle if he’s getting a bit much for me. Just depends on my mood.You must find him and put him on display. I’m sure the boys would like him. Oh My God. I have no words. (but I smell a future blog post coming!!) Thank you for that. Ali, can I use your picture for a guest post that I’m doing? Seriously? Seriously?! I love all things wacky and wild for the Christmas tree….that’s disgusting, but oddly I want one….I wonder if I could find one on eBay?